To turn your picture in to a personalised jigsaw puzzle, select one of the categories below and jigsaw puzzle size! We offer top quality personalised jigsaw puzzle sets that are printed with eco-friendly printers and robust and string puzzle cards. The puzzle pieces are cut from great quality cardboard using custom cutting dies to ensure crisp and clean cut puzzle pieces. Our online photo editor allows you to re-size, crop, drag and edit your photo in any way you wish. Even add text to make your puzzle set even more personalised. Our online photo editor allows you to see a clear preview of your picture puzzle before you confirm your order. Create your own personalised jigsaw photo puzzle at PuzzlesPrint! 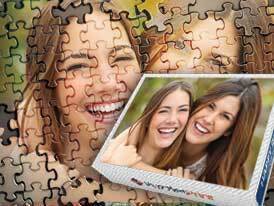 Take your memorable photographs and turn them into a glorious personalised photo puzzle. Choose from our variety of jigsaw puzzle designs, starting from only 6 pieces to 1000 or 2000 puzzle piece sets for the more enthusiastic puzzle solvers. Or puzzle sets will surely engage even the best puzzle solver for hours. On our website you will find wide range of personalised jigsaw puzzles, magnetic photo jigsaw puzzles, photo collage jigsaw puzzles, photo frame jigsaw puzzles, promotional jigsaw puzzles, wooden photo and plastic photo jigsaw puzzles. 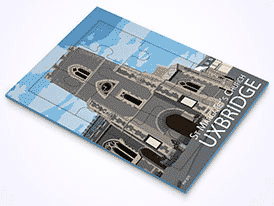 We deliver everything from personalised puzzles, magnetic puzzles, photo collage puzzles, frame jigsaw puzzles, promotional puzzles, wooden and plastic jigsaw puzzles all throughout Ireland. We offer both expresses as well as standard delivery options. 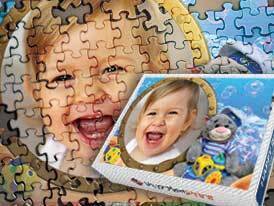 Allow PuzzlePrint to turn your special memories into a personalised jigsaw puzzle set. 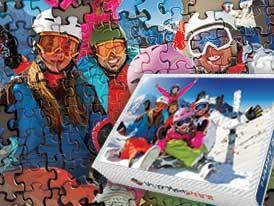 Photo puzzles make for an amazing gift for friends and family on almost any occasion. 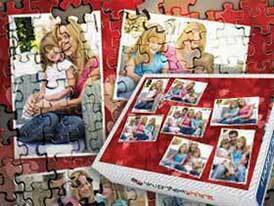 Show your loved ones how much you value your memories with them with a unique photo puzzle. Our beautiful custom made jigsaw puzzles make the ideal gift for anyone! Amaze your friends with this creative and sentimental gift on almost any occasion be it a birthday, Valentines, Christmas or Anniversary. Show your friends and family how much you value them and the special bond you share through this photo puzzle set containing all your favourite memories and photos. Choose your favourite photos and order a unique magnet puzzle set, or take multiple of your favourite pictures and create a memorable photo collage puzzle. Solve the puzzle and turn it into a lovely frame to put on your new memories. It makes for a wonderful decorative piece as well. If you love soling puzzles, then this personalised jigsaw photo puzzle will make the best gift for you. Engage yourself in a challenging puzzle and watch your memories form in front of your eyes! Our innovative puzzle set will be something unique and different from any puzzle you can buy from any store! If you wish to make something special, why not go for your photo collage puzzles? Allow us to create a beautiful photo collage jigsaw puzzle especially for you by simply picking a template, uploading several of your favourite pictures, and finally selecting the jigsaw size you want! You can also check out our photo frame jigsaw puzzles, a beautiful frame to compliment your photos. Choose from 8 different puzzle sizes and create a unique and memorable jigsaw puzzle to gift your friends and family on any special occasion! 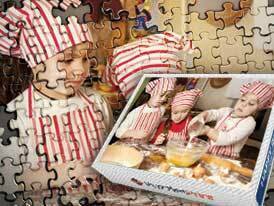 Impress your parents with a jigsaw photo frame containing all your favourite childhood memories with them! Our wide range of jigsaw puzzle sets can also be used for business promotions, of as a creative invitation or greeting card. The choices are endless! 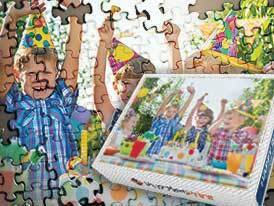 Check out our promotional jigsaw puzzle category and get ideas of how to use our amazing puzzle sets from anything to to birthday invitations! 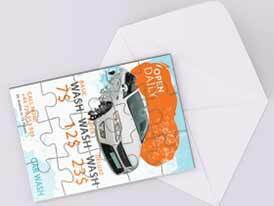 Make your occasion stand out with promotional jigsaw puzzles! Check out our wooden jigsaw puzzles. Made from great quality wood, and available in 2 different sized with 6 different piece counts, this puzzle set makes a wonderful gift for your grandparents or parents to set on their coffee tables. Three of our personalised wooden jigsaw puzzles have messages cut out of the pieces like I love you, Happy Birthday, and Merry Christmas. Add a premium touch to your custom made wooden jigsaw puzzle. Want a beautiful customised puzzle set, that is durable? Or maybe you want a puzzle set which is durable and child-friendly? Order a personalised plastic jigsaw puzzle, which is basically the same as our standard cardboard jigsaw puzzle but made out of plastic making it durable and strong. Choose form 6 different puzzle pieces to create your own puzzle set. Personalised picture puzzles can be ordered and will be delivered to all Ireland locations, including: Dublin, Cork, Limerick, Galway, Waterford, Drogheda, Kilkenny, Wexford, Sligo, Clonmel, Dundalk, Bray, Navan (An Uaimh), Ennis, Tralee, Carlow, Naas, Athlone, Letterkenny, Tullamore, Killarney, Arklow, Cobh, Castlebar, Midleton, Mallow, Ballina, Enniscorthy, Wicklow, Cavan, Athy, Longford, Dungarvan, Nenagh, Trim, New Ross, Thurles, Youghal, Monaghan, Buncrana, Ballinasloe, Fermoy, Westport, Carrick-on-Suir, Kells (Ceannanus Mór), Birr, Tipperary, Carrickmacross, Kinsale, Listowel, Clonakilty, Cashel, Macroom, Castleblayney (Castleblaney), Kilrush, Skibbereen, Bundoran, Templemore, Clones, Newbridge (Droichead Nua), Port Laoise (Portlaoise), Mullingar, Balbriggan, Greystones, Leixlip, Tramore, Shannon, Gorey, Tuam, Edenderry, Bandon, Passage West, Loughrea, Ardee, Mountmellick, Bantry, Muine Bheag (Muinebeag, Bagenalstown), Boyle, Ballyshannon, Cootehill, Ballybay, Belturbet, Lismore, Kilkee, Granard.